Lazarus will be given a new life in a new light on May 2 at 8pm at the Kings Theatre in Brooklyn. 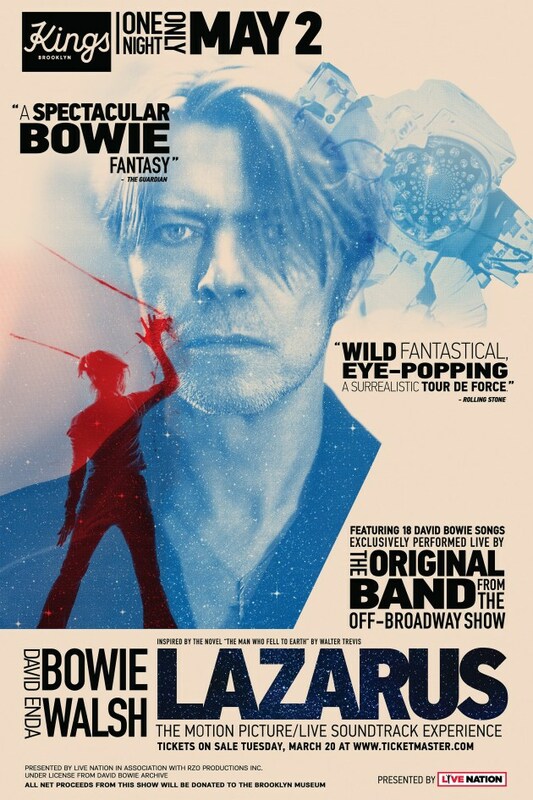 For the first time and for one night only, the theatrical premiere of a film of Lazarus’s London production will be soundtracked in the flesh by the actual band who brought the show to life in New York. Not only will fans who were unable to score tickets to Lazarus’s sold out New York run finally be able to see the show on the silver screen—they will have the unique and unprecedented experience of seeing the film with the music played in its entirety by the seven-piece band that backed Michael C. Hall and the Lazarus cast beginning with the show’s December 7, 2015 opening in New York City. Lazarus features of nearly 20 songs spanning the Bowie catalogue personally rearranged by David Bowie and Henry Hey, from singles (“Heroes,” “Changes,” “Life On Mars?”) to deep cuts (“Always Crashing in the Same Car,” “It’s No Game (Part 1),” “Dirty Boys”) to the four songs written specifically for the show (“Lazarus,” “No Plan,” “Killing a Little Time,” “When I Met You”). The Lazarus film/live soundtrack experience will mark the first time that these musicians have played these songs live since the January 20, 2016 finale of the show’s New York run. The original Lazarus band is comprised of musical director/arranger/keyboardist (and producer of the Lazarus Cast Album) Henry Hey, keyboardist/guitarist JJ Appleton, drummer Brian Delaney, saxophonist Lucas Dodd, bassist Fima Ephron, trombonist Karl Lyden and guitarist Chris McQueen. Together, they will provide live accompaniment to on screen performances by Lazarus London cast members including Michael C. Hall as Thomas Jerome Newton, Amy Lennox as Elly, Sophia Anne Caruso as Girl, Michael Esper as Valentine, Jamie Muscato as Ben, and more. Written by Bowie and Enda Walsh, Lazarus was inspired by Walter Tevis’s novel The Man Who Fell to Earth, and starred Michael C. Hall as Thomas Jerome Newton, the character Bowie portrayed in the 1976 film adaptation of that book. Directed by Ivo Van Hove and produced by Robert Fox, Lazarus opened December 7, 2015 at the New York Theatre Workshop to great critical acclaim. The New York Times raved “Ice-cold bolts of ecstasy shoot like novas through the glamorous muddle and murk of Lazarus, the great-sounding, great-looking and mind-numbing new musical built around songs by David Bowie,” while Rolling Stone hailed it as a “Surrealistic Tour de Force… milk-swimming, lingerie-sniffing, gin-chugging theater at its finest.” Tickets to the entire New York run of Lazarus sold out within hours of going on sale. The sold out London production of Lazarus, which was filmed for the May 2 event, had an exclusive limited run at the specially built Kings Cross Theatre from November 8, 2016 to January 22, 2017. Lazarus The Motion Picture/Live Soundtrack Experience is presented by Live Nation in association with RZO Productions, Inc., under license from David Bowie Archive. All net proceeds from this show will be donated to Public Programs at the Brooklyn Museum including monthly, talks, performances, and screenings.